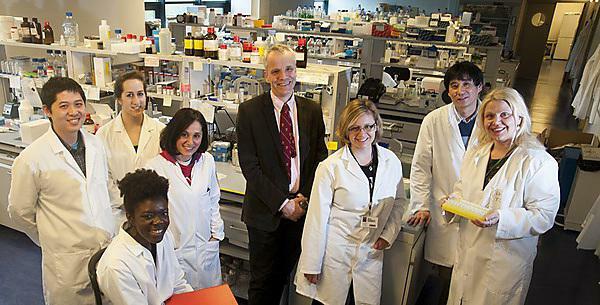 Brain Tumour Research is an official charity partner of the University of Plymouth. We're one of four universities in the UK working with the charity to improve the treatment and outcomes of brain tumours. You are invited to take a tour of Brain Tumour Research’s Centre of Excellence at the University and meet the scientists undertaking world-leading research into low-grade brain tumours and pioneering non-invasive treatments. A tour of our labs is a great opportunity to experience the environment, see the equipment and ask questions of the team undertaking this vital research on a daily basis. Visitors will be looked after by our local Brain Tumour Research regional fundraiser and shown the ‘Wall of Hope’, created to celebrate those who help fund the research, recognised by personalised plaques and significant dates. Indeed, our lab tours often coincide with a formal placement of more plaques (or tiles as we sometimes call them) on the Wall of Hope, a permanent recognition of the funds raised through the efforts of the charity’s amazing supporters. Email info@braintumourresearch.org or call +44 (0)1908 867200 to register your interest for a tour or for further information. Please note that there are limited places on the tour and attendance is on a first-come-first-served basis. ITSMed brings together world-class research strengths in both basic laboratory and translational clinical science, providing a strong, collaborative, interdisciplinary environment to develop high-impact, translational research of clinical relevance. Our focus is on three core research themes: Cancer, Clinical Neuroscience and Infection, Immunity, Inflammation, facilitated by cross-cutting expertise in Diagnostics, Clinical Trials and Public Health research. Visit our webpages for more information.